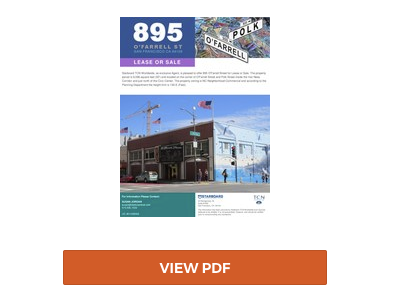 Starboard Commercial Real Estate, privately owned and locally-based San Francisco commercial real estate firm, is pleased to announce the sale or lease of 895 O'Farrell Street in San Francisco, California. Starboard has been chosen as the exclusive agent. The property is on the market for sale for $10 million, or can be leased for a monthly rent of $39,000. The 9,596 square feet property has been home to Mitchell Brother's O'Farrell Theatre since 1969. Located on the corner of O'Farrell Street and Polk Street inside the Van Ness Corridor, the neighborhood is diverse and lively with an array of restaurants, stores, health and fitness clubs, entertainment and music venues, lounges and bars. Polk Street is well-known for its vibrant nightlife and annual gatherings like Santa-con and Halloween pub crawls. Developers interested in building 50 percent affordable housing and 50 percent market rate housing would be able to fast track entitlements and build more units. Starboard Commercial Real Estate is the largest independently owned commercial real estate company in San Francisco, California. Starboard was established in 1991 with a unique vision of what a commercial real estate firm should be. With a combined total of 55 years representing landlords and tenants, members of the firm are devoted to serving clients with the highest ethics and professionalism. By implementing the latest technology, Starboard combines innovative market techniques with hard work, pursuing every opportunity to meet its clients' commercial property goals. Our brokers are highly qualified professionals supported by skilled support staff and a full-service in-housegraphic and website design team. Our brokers have access to critical information on existing tenants in San Francisco and more than 1,814 office buildings and over 103 million square feet of office space throughout San Francisco. In 2000, Starboard became the San Francisco member of TCN Worldwide Real Estate Services, a national affiliation of independent real estate firms located in more than 200 markets with 62 offices in 8 countries, including North and South America, Europe, and Asia. Using national and international real estate expertise, Starboard provides clients with local know-how on a global scale. Hans Hansson, managing principal, previously served on TCN Worldwide's Board of Directors and served as regional vice president for two years. For more information, visit www.starboardnet.com.